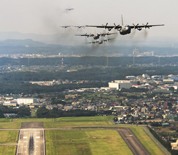 Yokota AB is located in Fussa, Western Tokyo, Japan. The host unit on base is the 374th airlift Wing which is responsible for airlift missions throughout East Asia. The Yokota Air Passenger Terminal is a major hub for Space-A travel, offering flights throughout the Pacific and the US West Coast. Yokota is host to the annual Friendship Festival, a two-day event during which local residents can visit the base and take tours. This Yokota AB directory features the critical info you’ll need to navigate through the many facilities and recreational opportunities available on base.